SkyBlock map 1.10 is one of the most popular and at the same time most played Minecraft Map ever created. The concept of this Map is very simple. You are spawned on a floating island and you must survive, but at the same time you need to complete the challenges of this map. 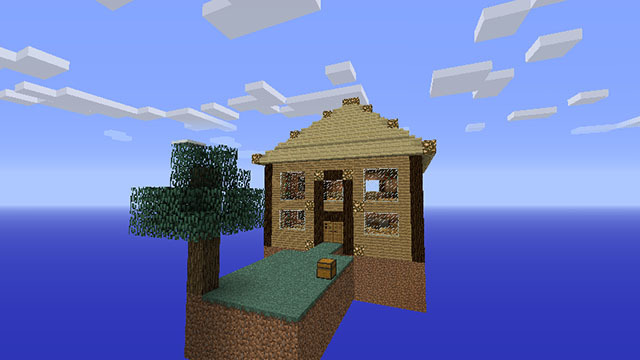 This map was very popular and loved by the players at the begging, after that, a lot of new maps similar to this one came out, but Skyblock Survival is the original one. After you have installed this map, you just need to survive on a tiny island that has only a tree and a chest full of useful things. With those things found inside of the chest you can survive if you use them in a smart way. For example, with Lava Bucket and Ice you can make a cobblestone generator. You have to pay great attention to what you are doing because there’s the risk to fall down. This map provides you with a lot of fun. It’s easier to survive in a forest but on an tiny island with just some items is hard. On this map there were 50 challenges at the beginning but after Minecraft 1.3 version came out, “Craft 10 bookcases” was deleted because after 1.3 Version of Minecraft you must have a cow in order to craft bookcases, but don’t be angry because there are 49 more challenges that will make you a good survivor. How to install SkyBlock Map Survival? Click on Windows or Start button and after press R to open the Run Prompt. Type into the prompt %appdata% and run the command. Access the following path ~/.minecraft/ by using a file manager. Woah! I’m really loving the template/theme of this blog. It’s simple, yet effective. A lot of times it’s tough to get that “perfect balance” between usability and visual appearance. I must say you have done a amazing job with this. In addition, the blog loads very fast for me on Chrome. Excellent Blog! It’s awesome for me to have a site, which is useful in favor of my experience.